Since its founding in 1964 as a leasing company, ORIX has expanded its operations to neighboring domains backed by the accumulated expertise. ORIX will continue to anticipate market trends in the ever-changing social and business climate. Through provision of innovative financial services at a global scale, we cultivate new businesses and opportunities for investment, thereby contributing to society. ORIX is committed to sustainable growth through efficient use of energy and recycling in business – fostering strong community relations, helping to strengthen societies from the local level. 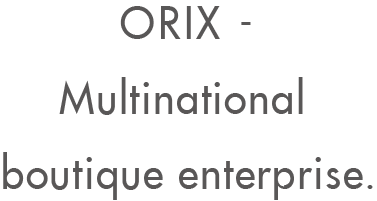 ORIX is a dynamic and diversified enterprise offering a broad range of services. With its rich history and worldwide operations, ORIX is a leader in numerous domains.